Note, if you hover over individual pictures and click the circle "i", it opens up an info pane that includes my descriptions. As planned, I got up early to move the LEAF with 80% state of charge back to Victory Lane Ford to get the final 20% while I processed and had breakfast at the Quality Inn. For those making EV road trips along this route, its proximity to the Victory Lane Ford dealer and its Level 2 charger make this a great place to stop. 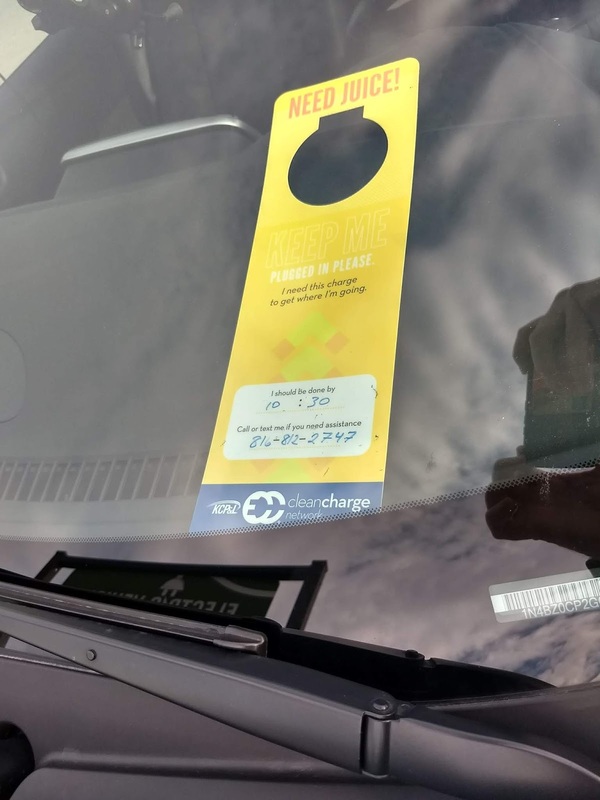 There's only one charger, so some EV Etiquette like leaving hang tags or an EV Frisbee on either the plug or the windshield will help make sure everyone gets a chance to charge. I got mine from the KCP&L www.cleanchargenetwork.com when I lived in Kansas City, but I've also ordered some from Take Charge and Go to hand out. Fellow EV enthusiast Sal also sells a similar concept of a EV Frisbee where you can use a whiteboard marker to let others know how long you'll be at the charger and a phone number where they can reach you. As expected, the Electrify America DC Quick Charger in Springfield is not yet active. So the planned stop at Hy-Vee Level 2 stop is the next best thing. 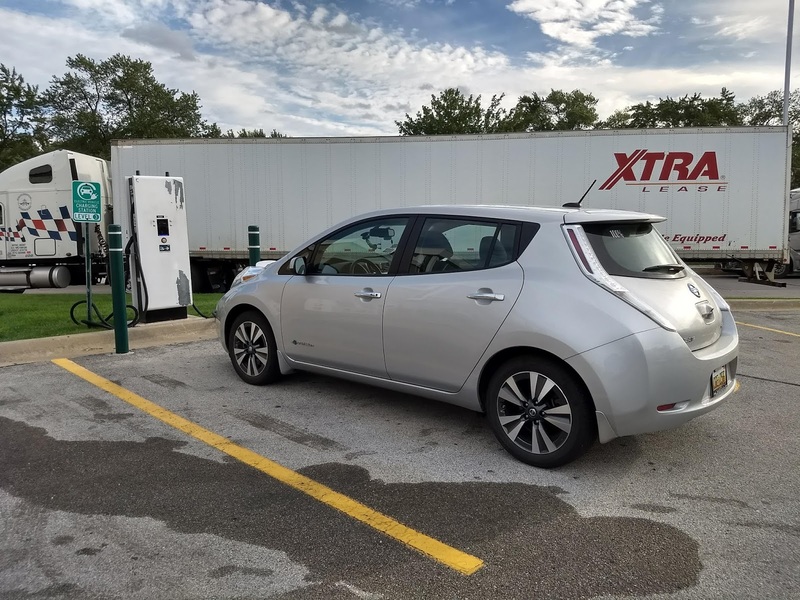 Hy-Vee has been supportive of EV charging infrastructure both in terms of Level 2 ChargePoint stations and Tesla Superchargers. Their 24-hour stores with Market Grille restaurants and the occasional premium coffee chain kiosks as well as WiFi make a stay there most pleasant. For fans of the movie Cars, Atlanta, IL reminds me of the fictitious Radiator Springs. 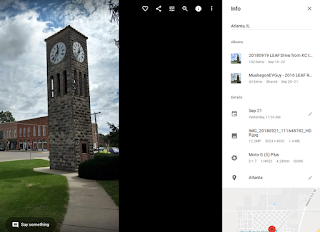 In its heyday, Route 66 passed through Atlanta and just like stagecoach stops of the Old West (Mahaffie in Kansas City comes to mind), the town prospered through visitors. 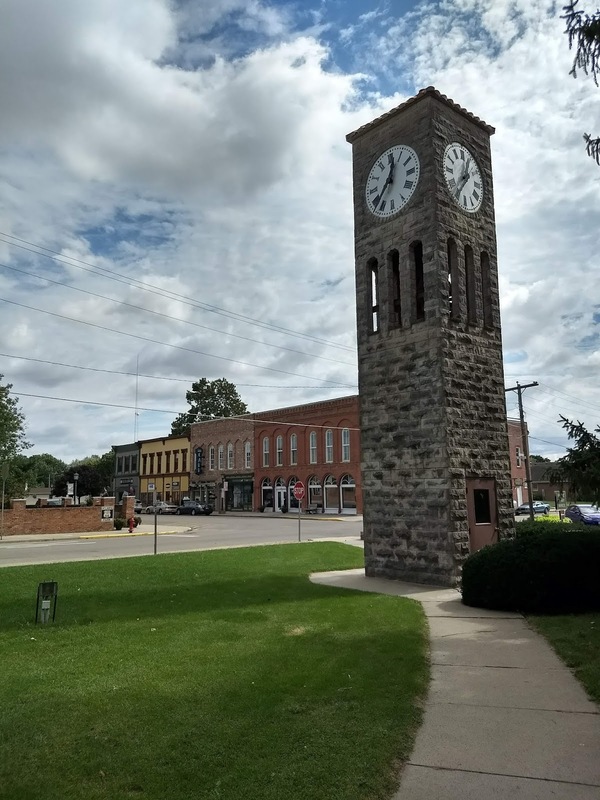 Once Interstate 55 bypassed the town, the businesses suffered. With the resurgence of nostalgic interest in Route 66, Atlanta is making a comeback. In fact, it's a gem! 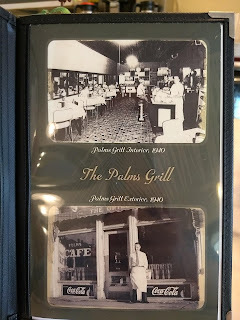 In addition to the town's library, clock tower with a history like that in the movie Back to the Future, a nifty little park with historical building artifacts and plaques, there's the Palms Grill. 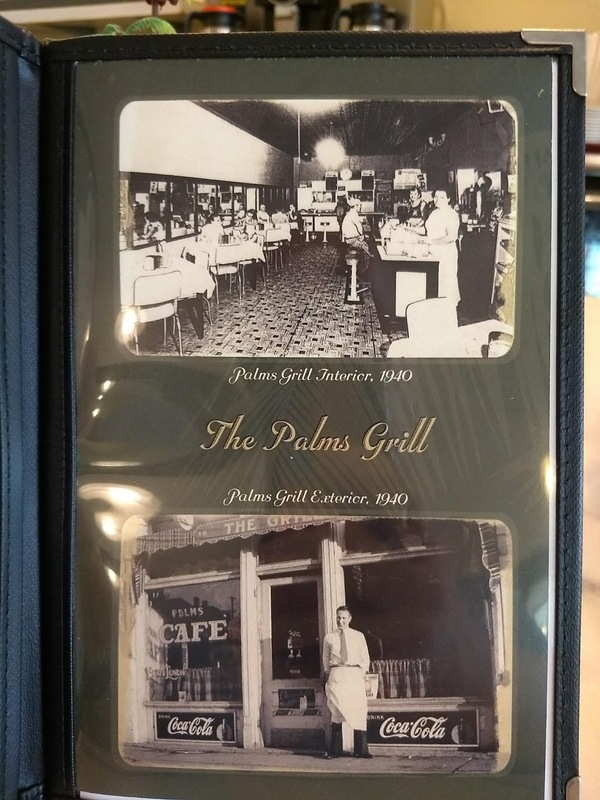 Known by the locals as "The Grill", the unassuming store front and menu board doesn't do justice to the 1950's style cafe and counter inside. I took a seat at the counter, soaked in the ambiance and selected a piece of rhubarb pie a la mode while sipping my coffee. After a few bites, I heard a jovial quip coming from the table behind me: "You gonna eat that whole thing?" I spun around to see what I presume to be an empty nester couple enjoying a late breakfast with a smirk on the man's face. To make a long story a bit shorter, I ended up bringing my pie and coffee to their table and we chatted a bit about life, kids in college and, of course, electric cars. My father always said: "The best thing about America is the Americans." This encounter was a prime example. After our exchange, we offered to pay for each others' meals and it was a draw with me leaving a tip large enough to cover my snack anyway. Having spent a wonderful hour or so in Atlanta, it was time to move on to Bloomington. In case I sound like a broken record of a Happy Days 45 (do you kids even know what a 45 is? ), you really must visit Atlanta when you drive I-55 between Springfield and Bloomington. Only a short jaunt up through Bloomington, I found the promised DC Quick Charger inside the Uptown Parking Garage next to the train tracks. Also the site of the Tesla Supercharger, there is a single Eaton DCQC with a CHAdeMO connector. CCS folks, you're out of luck as far as quick charging goes, but at least there's a row of about 6 Level 2 connectors as well. The first hour of parking is free, after that it's a nominal charge up to $6 per day. If I had more time, it would have been fun to explore the downtown. Normal has a few downtown colleges and college towns always tend to be fun to walk around to see what the businesses and attractions the "kiddos" have brought with them. Alas, it was time to move on. From Normal to Dwight was a cruise along Route 66. Although its glory days are gone, there are pockets of nostalgic stops along the way. 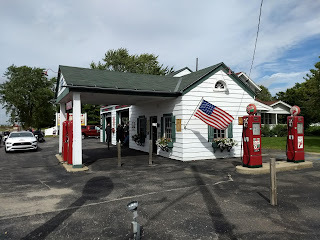 One such stop with old fuel pumps (does anyone still use those ? ;-) ) and other service station paraphenalia is Ambler's Texaco in Dwight. Important for me is that this stop has moved to the 21st century and sports a ChargePoint Level 2 station. While I would have preferred a DC Quick Charger, I'll take the Level 2 over a standard 120 V plug. I was kept company by a Chevy Volt, so luckily there were 2 charging spots. I had no chance of making it to my next intended stop with the 46% battery charge when I arrived. I departed with 78% after a bowl of soup and a piece of pie at the adjacent restaurant. The Chicago area has lots of Level 2 stations, but the day was wearing on and I had my eye on two consecutive DC Quick Chargers. The EVGo app indicated the Tollway Lincoln Oasis DCQC was available and I pulled in with a flashing low battery indicator with 19% state of charge. 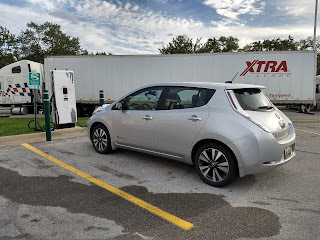 I even had an EV-curious bystander talk to me about the state of electric vehicle advances during all the hustle and bustle of this rest stop fuel station. My next stop was only 25 miles away and a free Nissan dealer DCQC, so in retrospect I should have made this a shorter stop. It's nice to have such a concentration of Quick Chargers, but I could have actually used this one a few more miles down the road. It's also in a location that could be accessed after hours. As it happens, they were still open. Sitting at the dealership, I had a few salespeople ask me about the LEAF and electric vehicles. While I'm happy to share my knowledge, internally I have to roll my eyes. You guys should know this stuff and be teaching others! They're your cars. 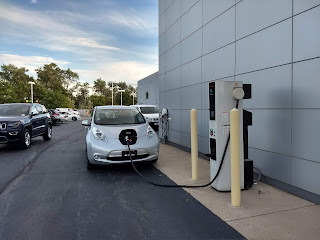 I had originally planned to stay in this area, but it turns out the Best Western Benton Harbor already had its single Level 2 charger occupied by a Honda Clarity plug-in hybrid. Knowing I would likely not be getting a charge there during the night and the nearly $150 nightly rate made me move on. I did need a charge to make it to the next charger. After Benton Harbor, there aren't many options to charge towards home. I found that the Whirlpool manufacturing complex has many Level 2 chargers at their headquarters and manufacturing facilities. The PlugShare rating was good and, sure enough, there were publicly accessible chargers in a big parking lot. The next hour or so was spent in the car looking at my options for hotels and charging while the security guard vehicle kept eyeing me up suspiciously. Ultimately, I decided I could make it to Holland, MI. Only 10% battery left (1 bar on the right) upon arriving in Holland. Back at Whirlpool, I was doing the typical mental dance of "How long should sit here and charge versus do I have enough power to get to the next stop?" I finally left with 72% battery and 55 miles to go. Normally, each percent of battery equals about 1 mile, so I was feeling confident. I hopped on the highway and quickly realized at 60-65 MPH and windy conditions, I was burning through power quicker than 1% per mile. Although I was tired and just wanted to get there, my first range anxiety of the trip was keeping me awake. 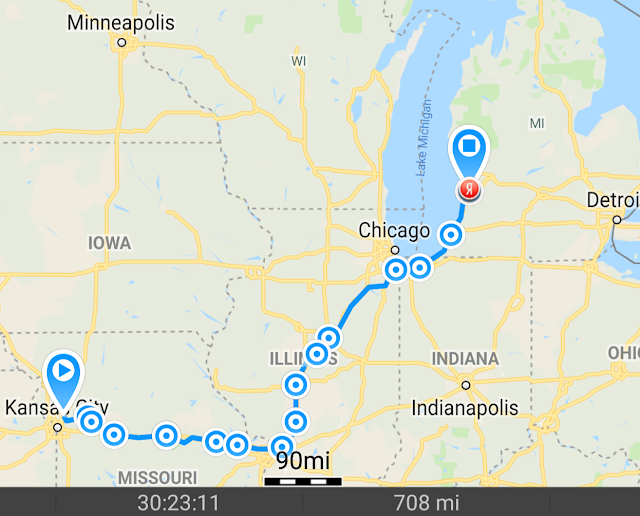 I exited the interstate and took the Blue Star Highway which traces Lake Michigan. 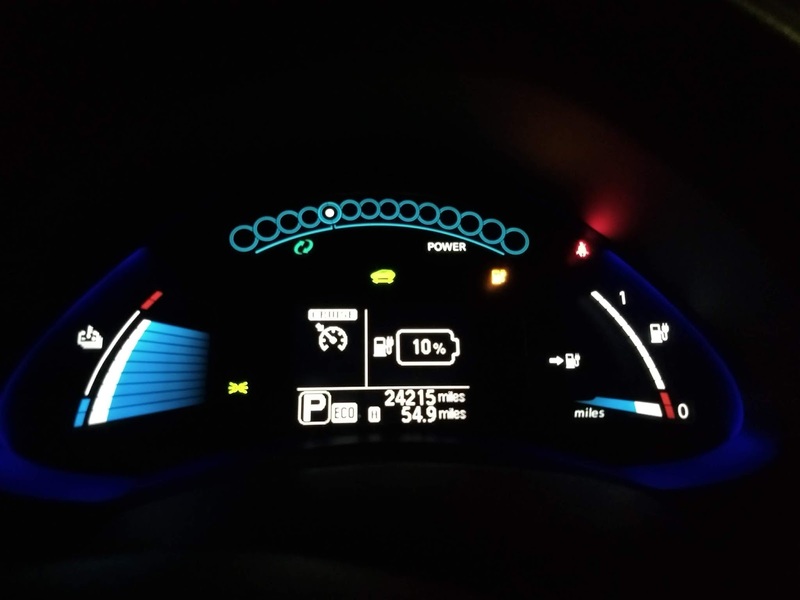 The final battery charge was 10% with the low battery warning flashing and a verbal reminder. Not totally a squeaker, but definitely out of comfort territory. The hotel I selected was next door to the Holland Board of Public Works with several Level 2 ChargePoint station. I swiped my card, plugged in, took my bag and walked to the hotel. 30 seconds later I received an automated info text from ChargePoint saying that the first 3 hours were charged at $0.50 per hour and the rate goes up to $2.00 per hour after that. Apparently, this is an "anti-squatting" pricing structure. While I normally understand this approach to keep people from parking their cars there all day, this time it meant I had to rethink my charging strategy to avoid having a $11.50 charging bill by 7 AM the next day. I decided to let it charge for about 2 hours, surf the net for a while at the hotel, then move the car and go to sleep. 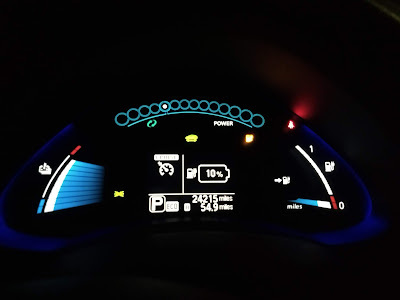 I'd catch the remaining charge in the morning by getting up and charging the car while I processed and had breakfast. With the promise of a properly charged battery and only 35 miles to home from Holland, I could breathe a sigh of relief. The planning had paid off and luck was with me that all planned chargers were functional and available. In the next episode, I'll write up some final thoughts and an Epilogue. 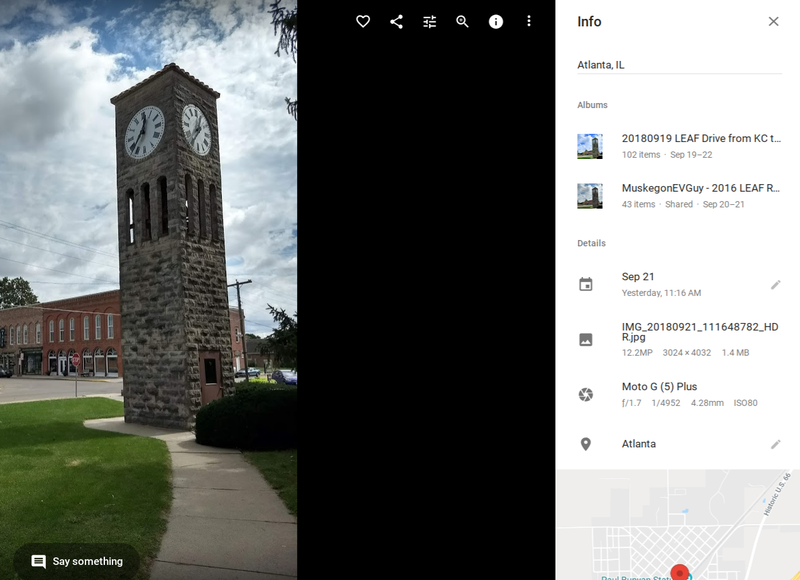 Again, photos are in this Google Photo Album with new pictures at the bottom. 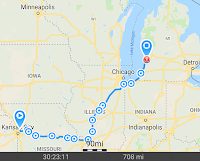 Again, the GPS tracker estimates high on the miles compared to the odometer due to my movement outside of the car plus some error allowance. There are some "hidden gem" charging opportunities between Benton Harbor and Holland. 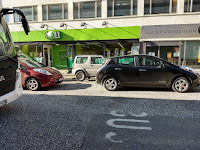 I don't put them in Plug Share because they are not really public charging spaces as much as community spaces. For instance, there's a farmers market pavilion that has several NEMA 14-50 plugs. There's a community art fair green-space with NEMA 14-50 plugs. 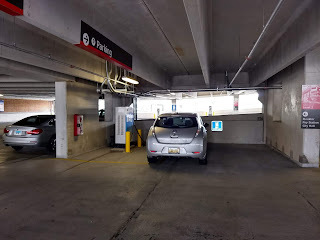 I'm glad you made it using the public charging infrastructure. Hi Kraig, thanks for the note. I have found a few of such gems which help supplement the public chargers. I do have a bit of concern about using such power sources if permission is not given. 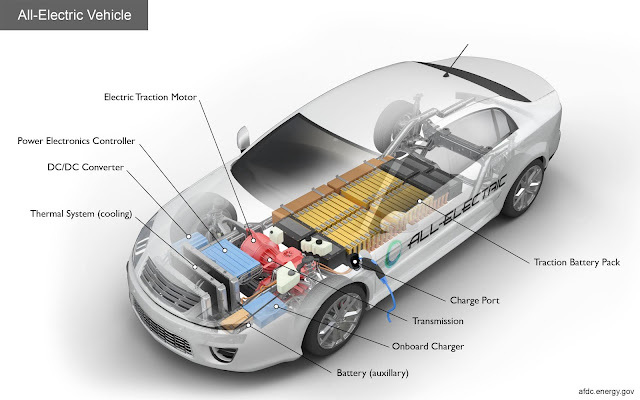 As an EV driver community, we don't want to give the impression that we are trying to get something for nothing. When I plug in at hotel or restaurant 120V outlets, I always ask for permission first and offer to pay for the power. Once I do the math for the management, they typically wave it off if I'm patronizing the establishment. One of the biggest untapped charging resources are RV parks and campgrounds. While some are listed, not many are. There's an app call "RV Parky" that catalogs RV resources including campgrounds with 50A service.